As I noted in my last post, some of the current whisky obsessiveness on this blog can be laid at the door of Richard Paterson, master blender at Whyte & Mackay and constant whisky show presence. My first in person encounter with Richard was a few minutes after getting in to Whisky Live Glasgow, where I was dragged on to stage to take part in a blending session. However, something that I’d forgotten was that I’d signed up to do a blending class and tasting with Richard at Milroy’s a week later. There was a lot of crossover between the two blending sessions, so I’ll stick them together. The basic premise of the session was to get people to understand blending with a ‘simple’ task – blend together 6 whiskies to try and represent the character of the person on a card in front of you. We were given some grain, lowland, Speyside, medium highland, heavier highland and smoky Islay as our ingredients and Arnold Schwarzenegger, Ronnie Corbett, Leonardo DiCaprio, Nicole Kidman, Jordan and a sumo wrestler as our inspiration. At Whisky Live I got Jordan, and after being told off for saying I wanted to make a “cheap tasting” whisky, settled on something with a heavy perfume and hint of smoke – heavy on the speyside with a body of grain and a hint of Islay at the end. I deservedly didn’t win that time, the honour going to Nicole Kidman, but my team picked up the accolade at Milroy’s with our sumo wrestler whisky – big and heavy with a slap at the end. Lots of heavy and medium highlands with a bit of Speyside, some grain (at cask strength) for welly and a hefty slug of the Islay for a late punch. 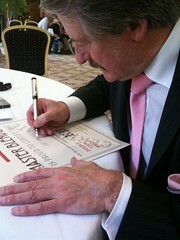 According to the rather large certificate that Richard signed for me I am now an official Whyte & Mackay master blender, but I won’t be giving up my day job quite yet – I have a small sample jar of ‘Jordan’ on the side and opening it for a smell does not fill me with enthusiasm for my skills. If you want to see the fun and games of the Whisky Live Glasgow session, social media king Craig set up a camera at the side of the room and captured almost all of it – part 1, part 2, part3. Including my being rubbish on stage in part 2. The more interesting bit (for a blending ‘veteran’ such as myself) at the Milroy’s event was the tasting we started off with, running through part of Whyte & Mackay’s premium range. We started off with Jura Prophecy, distilled in 1992 with 90% matured in bourbon casks and 10% in sherry. On the nose it had salt, grass and seaweed, toasted wood, caramel and hint of, maybe, sweet cooked carrots. It also had a bit of wood polish, some olive oil and a slug of damp peat at the end. To taste it had a tannic end led to by fizzy lemon, tarmac and polished wooden floors. Water definitely helped, bringing out more salt and some custard on the nose. The taste had sherbet lemons, bitter wood, sweet smoke and the custard from the nose. I’m already a fan of Jura, but this one was really rather nice – not as peated as I would expect from the ‘heavy peat’ reputation that Willie Tait (former Jura manager) pushed at Whisky Live and nicely balanced, with wood, citrus, smoke and sweetness all rolled together. Next was a bit of a move up, going on to the Fettercairn 24. I’d tried the 40 year old bottling at Whisky Live and not been blown away, and was interested to see what the younger expression would offer. 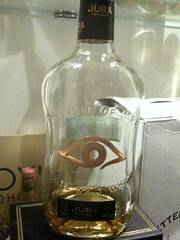 It was a lovely bronze colour and had orange, sweet fruit, liquorice, pine and lemon scented floor polish on the nose. To taste it had almonds and cinnamon with a bitter wood finish and a buttery mouthfeel. Water calmed down the bitterness of the wood, turning the almonds into marzipan and the fruit from the nose into fizzy fruit chews. On top of this was some hazelnut and a spicy woody finish. Much closer to the nose of the 40 year old (which was fantastic, even if the taste wasn’t to my liking), but maybe not to the tune of £120 per bottle. The marzipan flavour is something I’m definitely going to be looking out for in other drams and I may have to have a try of their regular 12 year old. We jumped up the price scale to the Dalmore 1974 Matusalem – named for its year of distilling and the type of sherry barrels used for its finishing. After an initial 27 years in rare palo cortado casks it sat finishing for 5 years in barrels formerly used to mature Gonzalez Byass’s rather special 30 year old oloroso, for a total of 32 years of maturation. 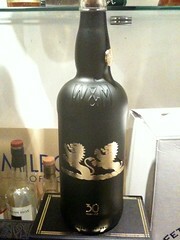 A rather limited release this one compared to many from Whyte & Mackay’s stable, with only 780 bottles of it in the wild. It was deep bronze in colour with a nose of candied orange slice cake decorations and perfumed almonds. To taste there was an initial burst of sweetness leading to raisins, marmalade and buttery lemons. Water brought out more floral notes, creamy vanilla, fizzy refresher chews and a woody finish. 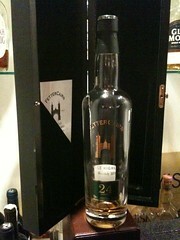 Quite impressive, as you’d expect for the second most expensive whisky I’ve ever tasted. 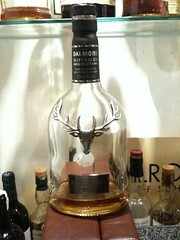 After the Matusalem the only way to move in price was down and we moved on to the Dalmore 1992 King Alexander III. I’d missed a chance to grab a dram of this at Whisky Live in London earlier this year, turning up moments too late and seeing a tray of glasses emptied before I could get to it. It is made up of whiskies that have been finished in 6 different cask types – port, madeira, marsala, cabernet sauvignon, Knob Creek bourbon and oloroso sherry – for 2-6 years depending on the type of wood (with the port taking 6). It poured reddy bronze with heavy raisins, woody sweetness and vanilla on the nose. To taste it had sugary sweetness, orange and vanilla, moved to a mid-taste of sweet raisins, and finished with spicy oak. I didn’t add water to it, and I wish I had – it was a bit of a muddle and I think it might have helped bring the various flavours out a bit. There was definitely a hint of all of the different finishes in there, but I’m not sure that it all worked together at bottle strength, only 40% though it was. We then moved on to our last dram of the night – Whyte & Mackay’s 30 year old. This is W&M’s premium blend and one that I’d got to have a quick sip of at Whisky Live Glasgow, enough to make me want to try it again. It’s definitely the top end of their range – with a boasted 25-27 components (a far cry from the John Glaser small batch approach) and bottled in black glass, it’s a cut above Whyte & Mackay’s regular range. On the nose it had custard, raisins and perfumed wood and to taste it had sweet custard with spicy oak bitterness and a lingering sherried fruitiness. Water bittered things up a little bit with dark orange chocolate joining the rich mix. Rather nice and further demonstrating that blends needn’t all be rubbish, grain heavy, Tesco’s shelf filler. 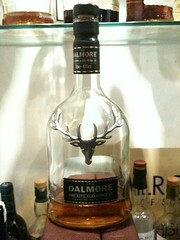 This stuff does cost £180 a bottle, but it is pretty good. It’s not got the sort of backing and reputation that Chivas Regal’s top brands and Johnny Walker Blue Label have yet, but it’s definitely in the same league as them. All in all a thoroughly enjoyable couple of events. Richard Paterson is definitely someone to see do his act in person, with over the top hand waving about ‘the pussies’ who don’t know what they’re missing, throwing whisky on the floor and audience, and the occasional party popper, although outside of that he is just a nice guy to have a chat with. I’ve not been to Milroy’s for a tasting before and while this one was a bit more than I’d usually pay (£40) it was an impressive whisky range that I’d not see elsewhere, with the 1974 Dalmore going for at least £40 a shot if you found it in a bar – I’ll definitely be keeping an eye out for more from them. The photos above are a bit rubbish because Milroy’s do their tastings in the basement under their Soho shop. It’s dark down there…but nice. Whyte & Mackay are currently running a competition to win a bottle of their 30 year old – find one of the bottles of their ‘regular’ Special Blended Whisky that has been filled instead with 30 year old (as indicated by a note under the cap) and you can win one of 250 additional bottles of neat 30 year old. There is more info, including a video of ‘Richard Paterson’ breaking into the bottling plant to be nefarious with the whisky, over on the Master Blender website. hi there, Do you know how can i be notified by all the blending and tasting events happening arround the world or even just in England cause i would really like to attend these events….